May in Wales is traditionally a joyous month, when spring has reached its climax and summer is just around the corner. The woods are carpeted with bluebells, swallows return to our skies, fresh green leaves burst out of the branches, birds tend their young and rhododendrons explode with colour. Swallows are the very epitome of summer in Wales. The most celebrated of all out summer migrants, the swallow is a truly remarkable creature. Look out for them catching flies above the fields and in the farmyard. The swallow in this picture spent the winter in South Africa. He then flew over 6,000 miles to build a nest in the cowshed at Plas Farm. He managed to cross the Sahara within three days, avoid dehydration and pass the Mediterranean and North African high nets of the humans who eat them as delicacies. All he has to do now is finish building the nest and wait for his wife to arrive in a fortnight. She will inspect the nest and add the finishing touches (internal decor). 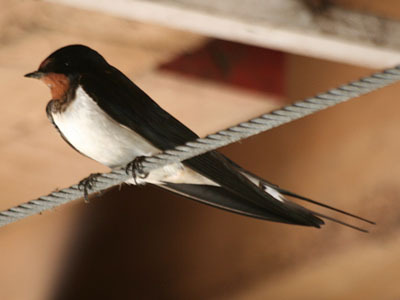 In 2003, we became part of a swallow monitoring program that resulted in 4 chicks born in the old dairy being ringed prior to their maiden voyage to southern Africa with the intention of tracking their progress. At the time of writing, no Plas Farm swallows have been recaptured. 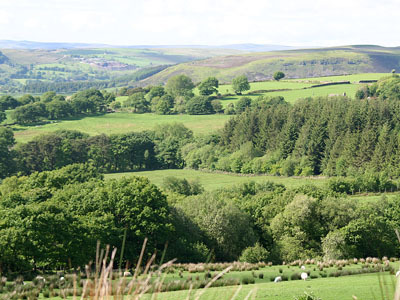 Plas Farm is a working sheep and beef farm. If you want to see lots of cute claves, then May is a good month. 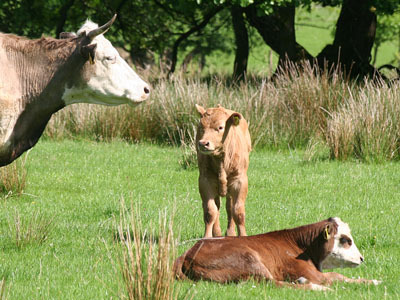 A beef cow is dry all winter, calves in the spring and rears its offspring over the summer months. Rhododendron ponticum is an evergreen shrub native to northern Turkey, but also occurs in parts of Spain, Portugal and Bulgaria. It was introduced to Britain in about 1763, probably from Mediterranean regions as an ornamental shrub and was planted extensively by the Victorians in the gardens of many large houses where it grew very successfully. The Plas Cilybebyll estate was no exception. Rhododendrons were used to beautify the grounds of the estate and were planted along footpaths through the woods and along the old entrance driveway to the main house. They thrived in the mild conditions of high rainfall and humidity, together with acidic soil. Indeed, when they got planted in the Swansea Valley they probably thought that they’d been planted in heaven. A wide range of rare and exotic varieties were planted as an expression of wealth, social prominence and extravagant lifestyle. 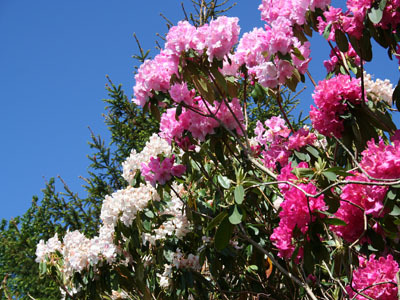 The deep shades of red, varying hues of mauve, pink and white are a sight to behold in the summer and it is said that cuttings were taken from the Plas Cilybebyll estate to stock Clyne Gardens, Swansea which now boasts an internationally recognised collection of Rhododendrons. This picture was taken on The Plas Farm Trail. You can spot the waymarker on the fence post and a stile between the trees in the distance. 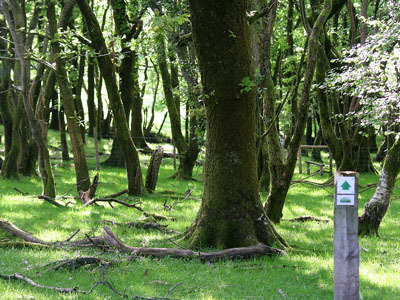 It is a magical part of the trail and a lovely place to stop for a picnic. The trees are mainly silver birch and willow. Carpets of unusual mosses join the trees and small native bluebells sprout through the green grazed grass. 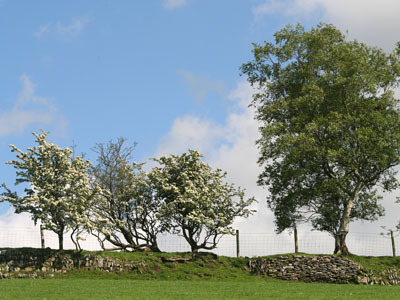 The name 'Hawthorn' comes from the Anglo-Saksen 'Hagathorn'. Haga means hedge. The scientific name 'Crataegus' comes from the Greek 'kratos' meaning 'strong', which refers to the hardness of the wood. Monogyna means 'one-pistil! Some of its many common names are: Bread and Cheese Tree, Hagthorn, Haw, May, Mayblossom, Mayflower, Maythorn, Maybush, Whitethorn, Quickset and Quickthorn. Some even call it the Faerie Tree as it is one of our most wild, enchanted and sacred native trees. This picture was taken in the fields on the mountain slopes behind the holiday cottages. It shows three hawthorn trees alongside a silver birch. Hawthorn is very valuable to local wildlife. It supports over 200 insect species alone, not to mention providing berries for birds later in the season. Britain has 18 species of bumble-bee. Bumble bees have much thicker, hairier bodies than honey-bees, usually about the same length. They forage for food, pollinate flowers and sting predators just like honey bees. They also have three castes - workers, drones and a queen which live in a social group. However, their colonies are much smaller than the complex colonies of honey-bees - up to 150 bumble-bees compared to 50,000 honey bees. Bumbles do not make enough honey for their colonies to survive the winter. In autumn, the workers, the drones and the old queen all die as the cold weather arrives. Fertilized young queens fly off and hibernate until the spring sun wakens them to found new colonies. The species in the picture has two yellow bands across its body and a distinctive white tail. 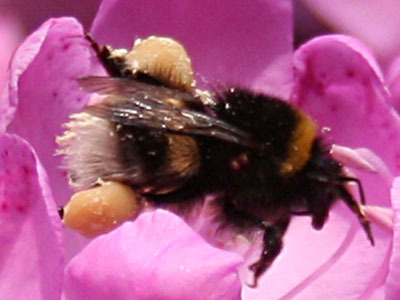 It is busy collecting pollen from a Rhododendron ponticum bush and storing it in baskets on its legs. 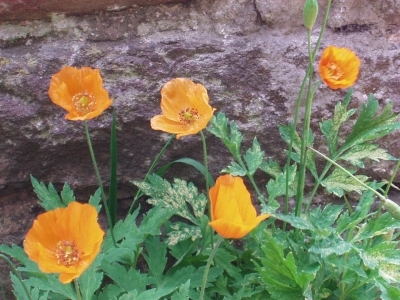 The Welsh Poppy is north-west Europe's only native species of poppy. It grows in abundance around the holiday cottages where it contrasts beautifully with the blue grey sandstone from which the cottages are built. The flower has recently been adopted as the logo of Plaid Cymru, the Welsh National Party. This picture was taken on the slopes of Mynydd Marchywel Mountain, a ten minute walk from the holiday cottages. It shows the upper Swansea Valley. The barren rocky mountain is Allt-y-grug, which translates as The Hillside of Heather. Red Kites are thought by many to be the UK's most beautiful bird of prey. Red Kites are distinctive because of their forked tail and striking colour - predominantly chestnut red with white patches under the wings and a pale grey head. Every now and then, one is seen flying acrobatically above the farm. Persecution meant that the bird was exterminated in England, Scotland and most of Wales by the end of the last century. Only in rural Mid Wales did Red Kites hang on, their numbers down to just a few pairs. Scientific research at Nottingham University claims that the entire population of kites in 1977 emanated from just one female bird. Thanks to the work of conservationists, Wales now has around 600 breeding pairs, (data courtesy of The Welsh Kite Trust) and they are being reintroduced to other parts of Britain. 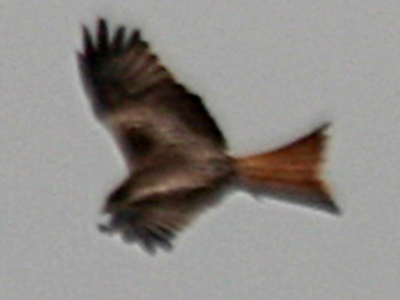 Red Kites are neither particularly strong nor aggressive despite being large birds. Primarily a scavenger and an opportunist; it profits from sheep carrion but is not capable of opening up sheep or lamb carcasses by itself and has to wait until more powerful birds such as ravens or buzzards have made the first inroads before it will attempt to feed. Red Kites are however predators and take a wide variety of live prey, ranging from earthworms to small mammals, amphibians and birds. If you not lucky enough to spot one at the farm, our holiday cottages are in a convenient location for a day trip to the Red Kite Feeding Station in the Brecon Beacons National Park.